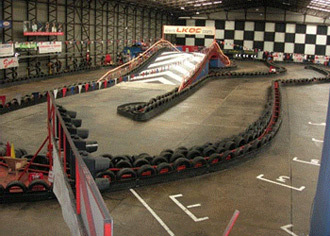 For go karting in Nottingham the Teamworks Centre at Langar airfield is the obvious choice as it provides a good range of events and activities for people of all ages. The kart track is one of the longest in the area and features a 150ft flyover section, which increases the length of the circuit to 1200ft. The karts used are the rather tasty Sodi 270cc models that are state-of-the-art as far as hire karting is concerned. There is plenty of attention to detail around the place so niceties such as 'proper' race suits and gloves as well as clean karts and helmets make the event just that little bit special. A full range of race formats for adults and juniors at very reasonable prices as well as multi activity packages that are perfect for stag do's and corporate events are available. Head south east on the A610 then at the roundabout take the 2nd exit onto Maid Marian Way/A6008. Continue to follow A6008, keep left at the fork and continue to follow A6008. Turn right onto London Road/A60 then turn left onto Cattle Market Road/A6011, continue to follow A6011, turn left on to Meadow Lane/A6011 and then turn right onto Lady Bay Bridge/A6011. Continue to follow A6011 and at the roundabout take the first exit onto Radcliffe Road/A52 then turn right onto Stragglethorpe Road. At the roundabout take the second exit onto Nottingham Road, go through one roundabout and continue onto Fern Road. Continue onto Cropwell Road and turn right onto Harby Road then turn left then right - Destination will be on the left. For groups of 30+ drivers. A non-stop 90-minute team relay race with 3 drivers sharing a kart. With a huge range of activities to include in your event from archery, mud buggy racing, treasure hunts, quad biking and paintball plus much more. Contact us for full details. One of the best selectiobns of activities available, including quad biking, archery, golf, paintball and much more. Activities can be included into a package that can last fro a half day or a whole of fun and excitment. Contact us with your details for a selection of options. There are conference facilities for 26 - 40.